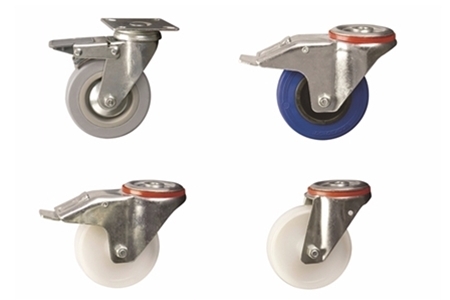 In this guide we look at the different castors and wheels available and explain how each of them works so that you can make an informed decision as to the type of castors and wheels you require for your catering equipment. If you are unsure about the castor you require, please contact us before placing your order. Plain bearing complete with threadguard. Combined swivel and wheel brake. Grey PVC tyre, white nylon centre. Combine swivel and wheel brakes. This is a castor setup where you'll be using one central bolt hole fitting, and this has a swivelling castor housing as well as a bolt hole diameter of the size M10, M12, M16. It's important to note as well that this type of castor can be fitted with a tubular expander in order to fit either square or round tubing. A swivel featuring a brake is also available for this type of castor. This castor is basically a square or rectangular plate that has four fixing bolts. What these four fixing bolts do is provide an overall strong fixing, and they also distribute the weight evenly. These can either be a swivelling castor, fixed, or else a swivel with a brake. It's safe to say that the larger your wheel is the easier it'll be to carry weight and move around. The bearings you use will also help to reduce friction and give you more ease of movement, but we'll get into the types of bearings in just a bit. The wheels for catering equipment can be broken down into two main categories: hard tread wheels and soft tread wheels. This type of wheel is by far the easiest to push, and it also offers the least resistance. The only thing with this type of wheel is that it is a bit on the noisy side, and it's also important to note that these wheels can damage certain types of floor. These wheels are available in cast iron and steel, nylon, polypropylene, and phenolic. Soft tread wheels will give you more resistance, which basically means that they'll be harder to push overall. But this comes with a trade off, as these wheels are far quieter and won't cause as much damage to floors in general. These wheels come in rubber, non marking rubber, polyurethane, high temperature rubber, and pneumatic wheels. There are actually four different kinds of bearing that you can choose from, and what these bearings do is reduce the rolling resistance that you experience. Of course the choice will be entirely dependent on your working environment, the application of the bearings, load capacities, and the amount of movement that'll be required overall. Plain bearings are meant for light loads that are moving over short distances. Roller bearings actually reduce resistance for heavy loads that are moving short distances. Ball journal bearings are precision bearings meant for heavy loads with constant movement. Lastly we have tapered roller bearings that are meant for the largest of loads. Which castor, wheel, and bearing are right for you? While there isn't a blanket solution that will work for every type of occasion, it's easy to see that by breaking down your needs into categories like the weight of the load involved, the amount of noise you're willing to tolerate for the job, and whether or not you're okay with damaging the floor, you can start to get a better idea as to which castor, wheel, and bearing are right for you.